For over 100 miles, the Rio Cahabón meanders through the rugged jungles of Central Guatemala, its output eventually bound for Lake Izabal, the Rio Dulce and the Gulf of Honduras beyond. With a few dams and developments along its course, it’s not always the most beautiful of rivers, but at a point south of the small town of San Agustín Lanquín, deep in the forest, something amazing happens. After taking a right turn and a few wiggles, the river arrives at a natural limestone formation known as Semuc Champey and plunges underneath it for over 300 metres – forming possibly the most terrifying waterfall on the planet. As the various falls and flows converge, they join up and rush down under the Earth at an unstoppable rate. A few unfortunate onlookers have fallen into the maelstrom at this point, disappearing into the churning underground river never to be found. Today, a guard stands by to keep people clear of danger. Above the surface it’s a different story. 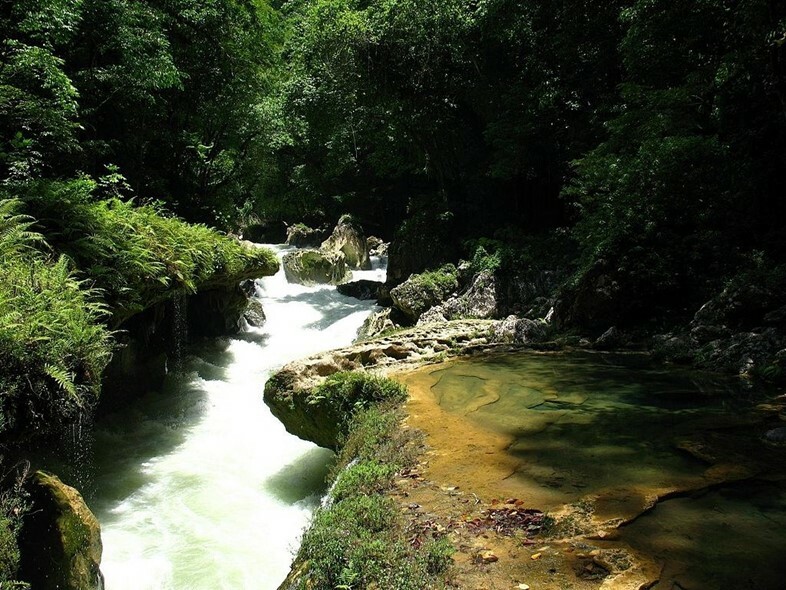 Some of the water from the Cahabón flows over the natural limestone bridge, cascading across and around it to form of a series of ultra clear, tranquil ponds. Surrounded by lush forest, the bright turquoise water is like a series of natural infinity pools that you can swim in; jumping from one to other as you trace the river’s progress. Amid the stillness, it’s hard to imagine the turbulent water rushing underneath you deep below the rock. 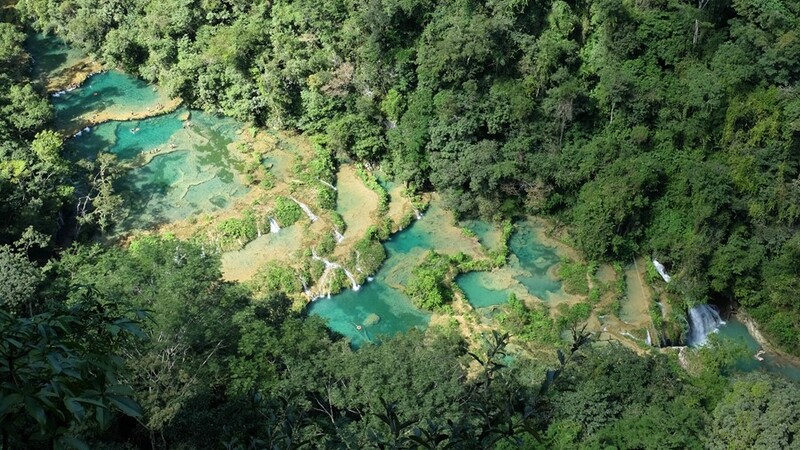 Designated a protected national monument in 2005, Semuc Champey is a unique example of travertine limestone – the same stuff that forms the pools at Pamukkale in Turkey. Set amid a landscape of karst stones and caverns, Guatemala’s version of the geological feature is a rare and beautiful sight. As warm, mineral-rich water rises from hot springs and cools, it releases CO2 and becomes less acidic, depositing limestone on the rim of each pool as it trickles down. Over time, the pools grow deeper and deeper as the limestone slowly builds up. In other parts of the world these springs often stand alone amid incredible landscapes, but at Semuc Champey the process gradually covered the Rio Cahabón, creating the underground river and a paradise amid the rainforest. 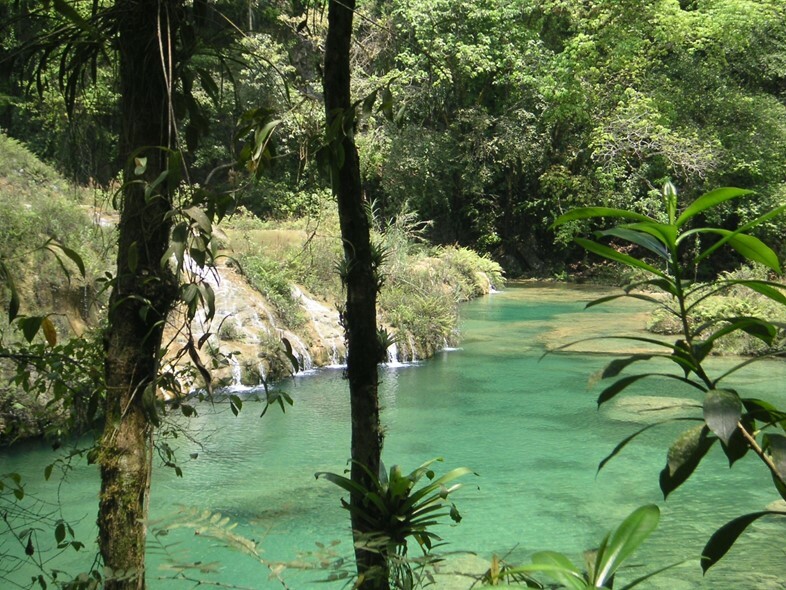 Although a little off the beaten track, Semuc Champey is good place to stop if you’re heading from southern Guatemala to Tikal in the north. There are a couple of traveller-oriented eco lodges, plus forest hikes, birdwatching and caves to explore nearby.